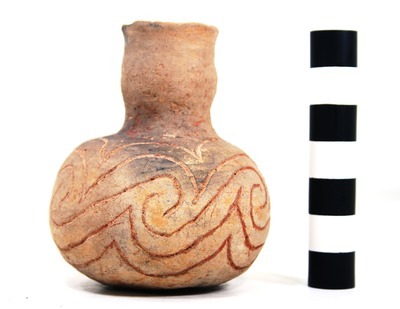 "41HS825, 2003.08.37, Burial 8, Vessel 32" by Timothy K. Perttula and Robert Z. Selden Jr.
DECORATION (INCLUDING MOTIF AND ELEMENTS WHEN APPARENT): The vessel body has an engraved scroll motif that is repeated five times around the vessel; the scrolls end in hooked arm elements. There is a zone of tool punctates on the upper body, above the engraved scrolls. Taylor Engraved spool neck bottle, Burial 8, Vessel No. 52, Patton site.